Since 1912, Kingsbury has gained unequaled experience in designing and manufacturing thrust bearings. This section details design features which we developed to improve your machine's performance. For Kingsbury thrust bearings to operate safely and efficiently, continuous self-renewing oil films must be present between the shoes and collar. The oil supplied to the bearing should be cooled and filtered, so that the average particle size is less than the bearing's minimum film thickness. The typical oil flow path is shown below. 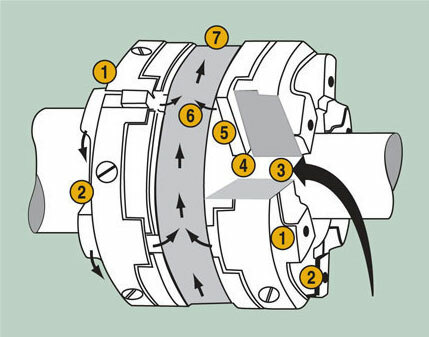 To understand end play, or axial clearance, picture a double thrust bearing (one on each side of the collar). End play is the distance the thrust collar can be moved between the bearings during installation while applying load to either bearing. Note: End play isn't an exact dimension. The shaft's maximum end play is limited to the smallest clearance between the stationary and rotating machine elements, while the shaft's minimum end play must be sufficient to prevent excessive power loss in the unloaded thrust bearing. 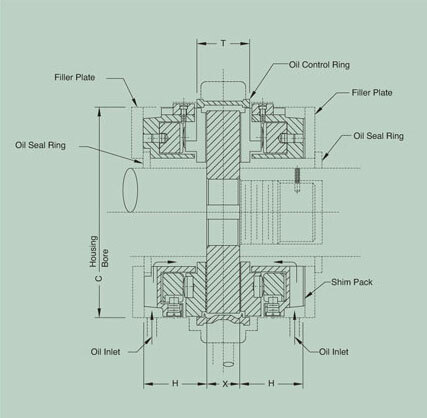 Any time a double thrust bearing is installed, end play must be provided to allow for an oil film to form in each bearing, and thermal expansion of the bearing elements. Design Option: Normal thrust bearing overall height tolerances are about ±0.04" (1.0mm). To obtain suitable end play, filler plates, machined to adjust for the tolerances of the thrust bearing and bearing housing, should be installed. If it isn't practical to use filler pieces in the bearing assembly, thrust bearings can be provided with height tolerances of ±0.005" (0.13mm) on special order. Oil enters the annulus in the base ring. Oil passes through radial slots in the back face of the base ring. Oil flows through the clearance between the base ring bore and shaft. Oil flows to the inner diameter of the rotating thrust collar. Oil flows between the shoes and into the films. At the collar rim, oil is thrown off into the space around the collar. Oil exits tangentially through the discharge opening. Oil enters the sump and is pumped through a filter and cooler. Oil passes through the inlet orifice, which controls flow rate. Important: While the total filler dimension (F1 + F2) is easily determined, the individual thickness dimensions F1 and F2 must be selected to position the shaft collar for proper spacing of the stationary and rotating machine elements. Remember that the operating film thickness of the loaded bearing will be much less than that of the unloaded bearing, causing the collar centerline to shift toward the loaded bearing during operation. Design Tip: Allow for a slight, permanent set in the bearing elements by specifying a plus or a minus range for end play. Place the thrust bearing (shoe babbitt up) on a smooth surface. Carefully rest a flat plate atop the shoe babbitt surfaces. Measure the height between bottom surface and top plate at a minimum of three locations around the bearing periphery. 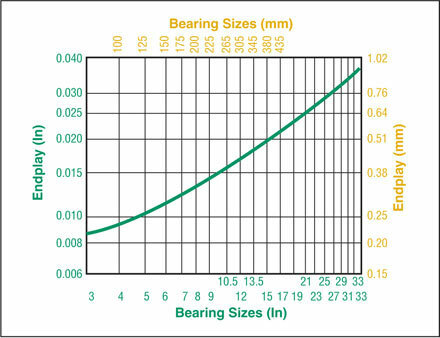 Average the readings to determine bearing height.